This post is my entry into the BlogPaws Blog Carnival Contest sponsored by BISSELL Homecare, Inc. I knew having dogs that were close in age meant there would be a time when I could lose them close together; I just never thought I would lose 2 of them in the same week. Having to make that decision was one of the hardest and most upsetting decisions I ever made, but destiny has a way of stepping in and make things okay. Life goes forward no matter what happens and the day after putting my second dog to sleep I found myself running errands. One of my last stops was at the bookstore where I headed to the pet section like normal. I knew I wanted to get another dog, maybe toward the end of the year and I had always liked Jack Russells so I grabbed a breed book to look through. After reading about how they really weren’t good with cats and other small animals, I left the store after deciding they probably weren’t the right breed for me. I headed to my next stop, the animal shelter, to get a license for my Dachshund. I debated about going, I was tired and really wanted to go home. Since I was so close I went so I would get it over with and not have to worry about it. The waiting room was a little busy with people going in and out, but it wasn’t busy enough that I didn’t notice the dog that was being surrendered. In fact, he noticed me as well and I found myself locking eyes with a young Jack Russell Terrier. His stare was so intense I wondered what he was thinking. Listening in on the owners I found out that at 5 months old, this guy was already losing his second home. After they had completed the paperwork and went into the kennel area, it was my turn at the counter. I wasn’t going to, but something made me ask about him. They said if I was interested, I’d better act fast, because he would probably find a home fast. I found myself heading back to the kennel area. I quickly located him and asked one of the shelter workers if I could take him out of his kennel. When I took him out he showed me a little bit of what I would have in store. He saw the dog across the aisle and turned into the Tasmanian Devil. I didn’t let that stop me and I took him around the corner to see what he was like when he wasn’t near other dogs. Once away from other dogs, all his attention was on me and what I found was a happy, energetic pup. Next thing I knew I was at the counter filling out adoption forms. After being told I could pick him up Tuesday after he was neutered, I left the shelter wondering if I had really adopted a new dog, and a Jack Russell at that! What did my household have in store? Tuesday morning I was at the shelter first thing. On the whole drive to the shelter I was thinking about names and had decided on Chaos. At least that was his name until I saw him again. The moment he came out the door to the waiting room, the name Ricochet popped into my head. It seemed a much better fit so Ricochet he became. Ricochet was the dog I didn’t plan on, but one I really needed. 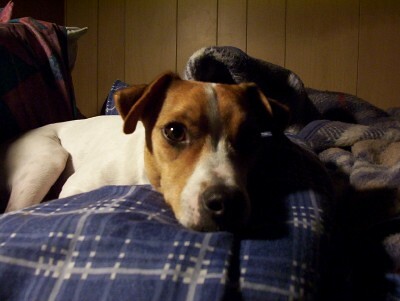 Even with all my worries about Jack Russells with my other pets, he managed to fit in with little trouble. Together we’ve stayed busy using up some of that energy with training for obedience, canine freestyle, tracking and even a little acting. We’ve worked through reactive dog issues and now since he lost his sight we are learning to help him move through his world easier. It’s been 10 years since he was brought into my life. While he didn’t take the place of the 2 dogs I lost, he certainly helped ease the pain. this was wonderful! Our babies have strange ways of coming to us don’t they? This was so beautiful! It’s funny, just today a friend said to Jen that maybe that when she found me that maybe I wasn’t the one that was lost. There’s no denying it – they pick us, and they know who needs them. Beautiful story! Thanks for the comments everyone! I like to think of them as destiny pets, the ones that are meant to be in your life. Wonderful post, Dawn. It was truly meant to be.